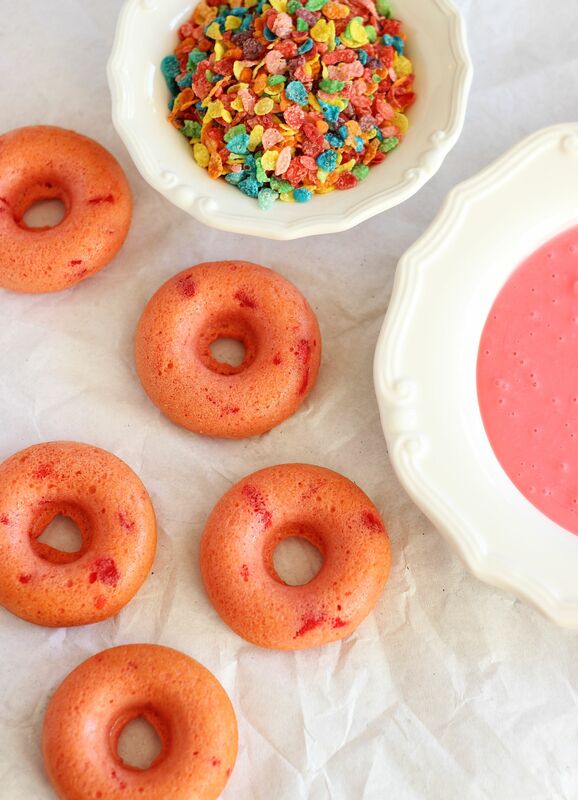 Super easy baked maraschino cherry cake donuts with a simple cherry glaze and crunchy Fruity Pebbles for a topping! 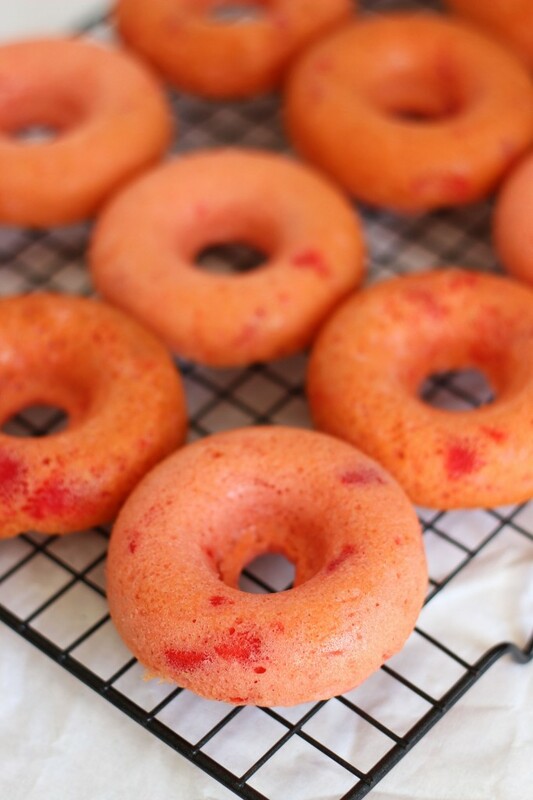 These Baked Cherry Donuts with Cherry Glaze are my FAVORITE, and they’re SO simple! I have a special soft spot for cherry donuts. I really love them. They’re delicious and they’re one of my favorite. Sooo, yeah. 🙂 I had to create these Baked Cherry Donuts with Cherry Glaze so that I can have a cherry donut whenever I want. I don’t know what it is for me about a cherry donut, but there’s something nostalgic about them for me. I can’t figure out why I feel that way though! There’s no particular reason that I can pinpoint or recall, but Baked Cherry Donuts with Cherry Glaze sort of remind me of happy times for some reason?? I’m sure this makes no sense. Maybe it’s because donuts in general though are a kind of a source of nostalgia for me. They remind me of the days when my Grandpa would run out to buy a dozen at our favorite local donut shop. When I’m in Erie visiting my family, I try to make a point to stop at H&K Donuts to get a dozen… both for old times’ sake, and because, um, we all love donuts, of course. 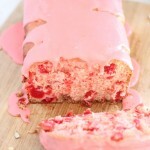 With cherry donuts on my mind, I really wanted to create an easy baked cherry cake donut with cherry glaze. And this is just that. They’re very simple to make. The fruity pebbles? Well if I’m being perfectly honest, I thought they would look fun and colorful on top and would probably (hopefully) taste good too. They do. Yay! We get to eat food that looks fun and cute, and tastes as good as it looks! I love when that works out. Sometimes ugly food is delicious, and sometimes really pretty food totally stinks in the flavor department. It’s nice when the two line up. 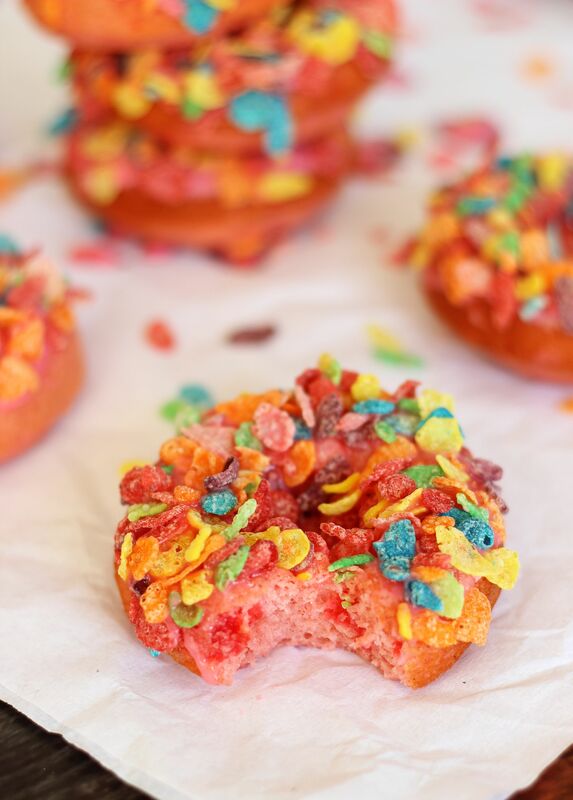 The fruity pebbles also enhance the fruity cherry flavors and they add a nice little crunch for texture for these Baked Cherry Donuts with Cherry Glaze. The batter whips up quickly, the donuts bake in about 15 minutes, and the glaze is a cinch – just whisk together the ingredients in the bowl. You could be eating these Baked Cherry Donuts with Cherry Glaze in about 25 minutes, start-to-finish! 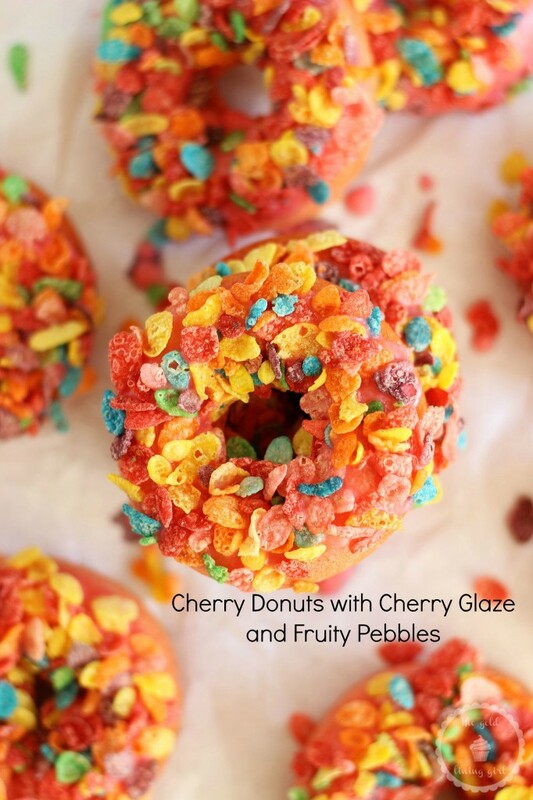 These simple baked cherry donuts have a cherry glaze and crunchy Fruity Pebbles as topping! In another bowl, whisk together egg, buttermilk, cherry juice, cherry extract, and melted butter. Allow to cool for 5 minutes, then flip the pans over and tap the donuts out onto a wire rack. Cool completely. Spread out the Fruity Pebbles on a small plate. In a small bowl, combine powdered sugar, cherry extract, and cherry juice. Whisk until smooth. This consistency was just right so that the glaze wouldn't run off the donut, but you can thicken or thin the glaze accordingly, if needed. To glaze the donut, dunk the donut into the bowl of glaze, covering about 2/3 of the donut. 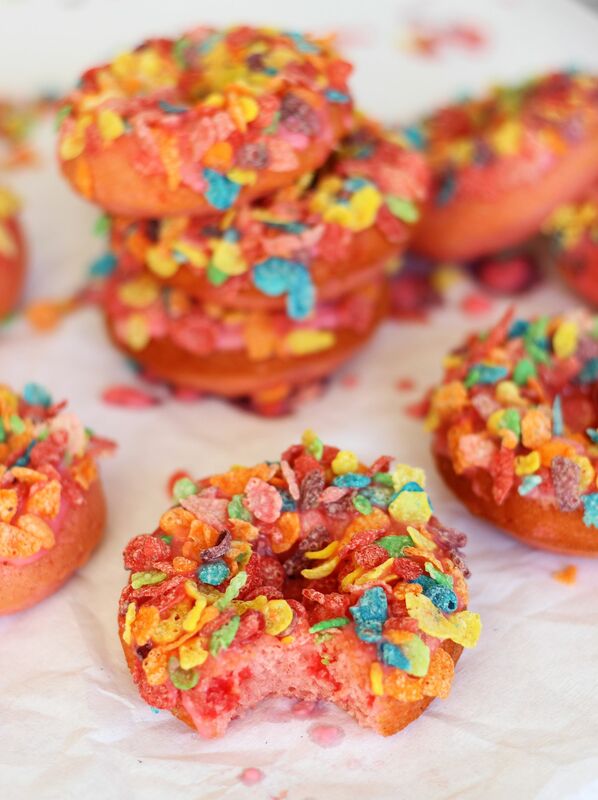 Allow the excess glaze to run off, then immediately dunk the donut into the plate of Fruity Pebbles. Place the donuts back on the wire rack to set for about 10-15 minutes before eating. Enjoy! If you’re a fan of easy donuts, you may also want to try these Baked Chocolate Donuts with Peanut Butter Glaze and Reese’s Cups (so decadent! 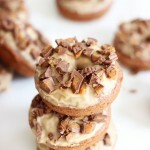 ), these Spice Cake Donuts with Pecan Streusel and Brown Butter Icing (to-die-for! ), or this really lovely Baked Red Velvet Donut Recipe. They’re so simple, delicious, and pretty. Won’t these fun and colorful donuts lull you into believing that spring will be here soon? Let them brighten your morning! Sarah, I love these donuts! 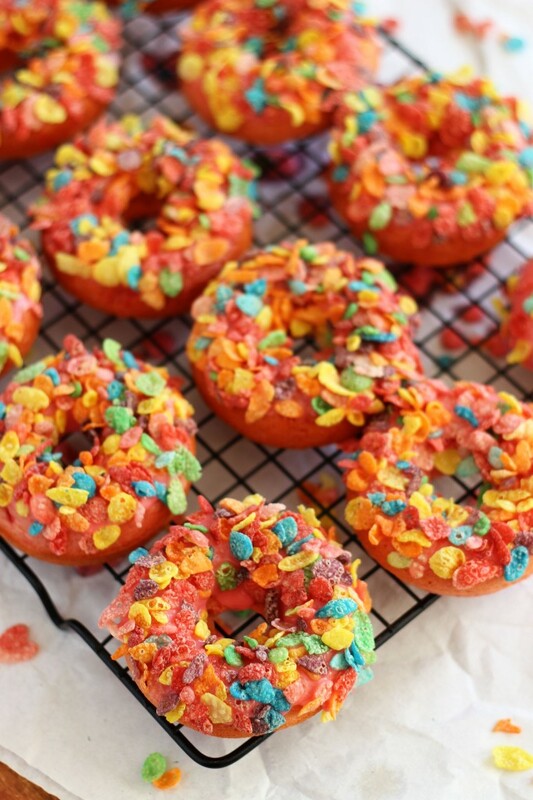 I’ve always wanted to make something with fruity pebbles (my favorite cereal) so these are perfect. And I don’t think I’ve ever had a cherry donut before! They sound delicious! Such a fun treat! Oh I love cherry donuts! You should try them! I love Fruity Pebbles too! Sugary cereals are a guilty pleasure of mine. Thanks, Gayle! These sure are pretty and if you are a Fruity Pebbles lover, Yum! I agree! They’re pretty darn cute! Thanks, Linda! Those are definitely bright and colourful Sarah! So fun! So colorful! Love them Sarah, now only if I could grab one out of the screen! 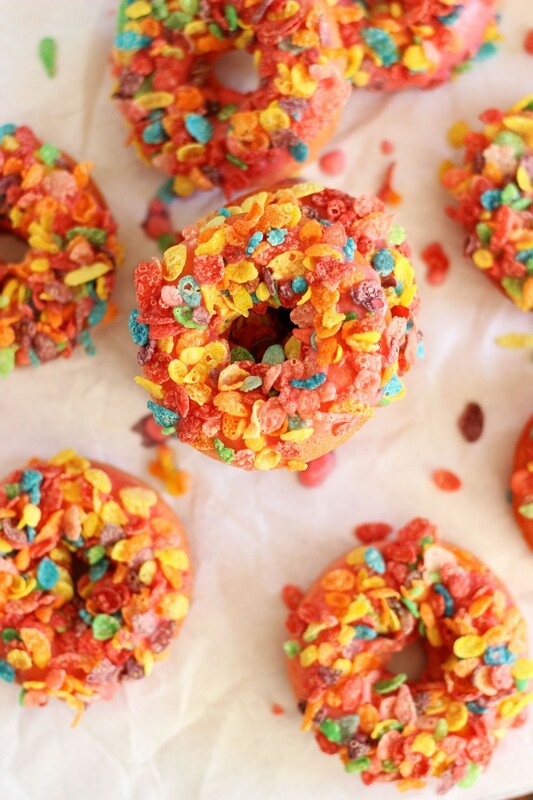 It’s a fantastic idea to top the donuts with fruity pebbles! Pinned. These look absolutely delicious! 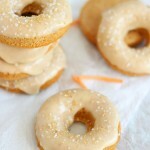 Do you think I could use the same recipe to make a cake instead of donuts? Thanks! You know, I really have no idea! I’m sorry – I haven’t tried that! I think it probably would make a good cake, but I can’t say for sure. If you try it, let me know! I’d be curious too because I wondered about using this batter for cupcakes at some point! These are so eye-catching! 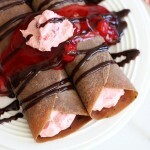 They would be gorgeous at a brunch, yet kids would love them too! I was Fruity Pebbles obsessed as a child 🙂 Thanks for sharing at Ducks N A Row! Love this! Thank you so much for linking up at Tasty Tuesday! What an interesting doughnut flavor! They sound delicious, though–I’d totally go for one of those as a breakfast 🙂 bet they’d be great as muffins too! Bright and fun. I love them. Saw this on the Happiness is Homemade link party. These looks so tasty, and the fact that they’re are baked and not fried is an incentive to give them a try. Not sure if I can get cherry extract but I’ll try, pinning. Diane @ Mrs U Makes. Hi Diane! You can get away without the cherry extract – the maraschino cherries and cherry juice are sufficient, but I like the extra oomph. I think I get my cherry extract from Walmart, so hopefully you can track it down! I don’t have a difficult time finding it! 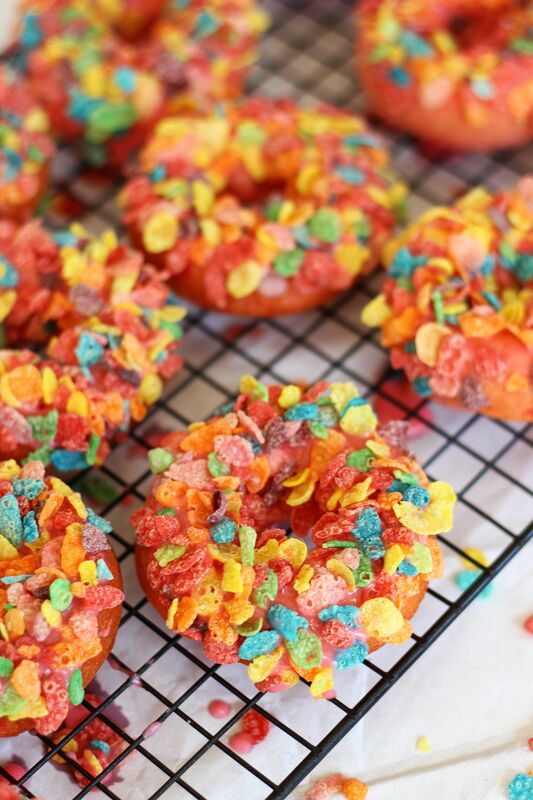 This looks realllly good 🙂 Fruity pebbles were always an awesome cereal and now its so cool to see them in recipes! These are great donuts! 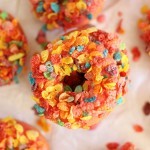 The fruity pebbles add extra fruity flavor and the crunchy topping is fun for texture!! 🙂 Don’t you love kid cereal? I still love it! These donuts were amazing. I substituted the cherry extract for 1 tbsp of cherry preserves and it came out perfectly because none of my local stores had the cherry extract in stock. I also lightened them up a little by using low fat buttermilk and covered them with sprinkles. Great Recipe! Oh that’s great to know! Somebody else had trouble finding cherry extract too – the preserves are a great sub – I love that idea! I find Watkins brand cherry extract at Walmart. So glad you liked the donuts!! Very easy to follow recipe. The only thing I didn’t do was the fruity pebbles because I didn’t have any & I added a tinge of pineapple rum to the batter. I just used the given cherry glaze & added some mini chocolate chips & sprinkles over it. My first round came out somewhat brown & hard so I baked the rest at 325 Deg for about 12 minutes. They came out softer & lighter in color. Different from the deep fried versions but nice to have a baked one at hand. Hey Cheryl! Thanks so much for leaving feedback and notes! I love when readers let me know how they turned out, and it helps out other readers too. So glad you liked these! 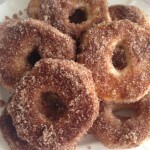 It really is nice to have a donut recipe that doesn’t have to be fried. Baked donuts are such less work. LOVE LOVE LOVE the idea of pineapple rum!! Omg, I NEED to do that. 🙂 Happy Thanksgiving!